The L.A. Times has posted an article and a recipe for my favorite summertime food, Mul Naengmyeon ë¬¼ ëƒ‰ë©´. Lots of people have been asking how to make this at home, and I haven’t made it from scratch yet to give out a recipe — not when it just costs $4 to get myself a megabowl. At the restaurant chain Yu Chun in Los Angeles, the broth is icy cold — with snowy, shaved ice piled on top. It’s not unheard of at restaurants here to find ice cubes floating in one’s broth, although the practice of adding ice isn’t de rigueur in the Koreas. Who out there — those of you who have eaten Mul Naengmyeon in Korea — have NOT had shaved ice in their bowls? I’d return my bowl if it wasn’t there. In all fairness though, central L.A. (Koreatown) is Korean restaurant central. I think Korean food is coming more to the fore now because Koreans are more prominent in the media and entertainment fields, so more folks are curious. Also, I’ve been hearing a buzz for a couple of years about certain celebrities and musicians who love going to the restaurants there for some good Korean food. The funny thing is I’ve decided to stay late in my office today. Between the rain, rush hour traffic and having to study Korean, I’ve decided to just stay put. The dish for today on the cafeteria menu downstairs: a choice of mul naengmyeon or bibim naengmyeon. Good timing L.A. Times and ZenKimchi. I don’t remember shaved ice, but I do remember ice cubes, Perhaps that’s a more recent innovation? Here, I just get chilled broth. Well, I’ve never seen (or eaten) prawns in naeng-myun. Is it common nowadays? I guess the shrimpies are an LA thang. With vinegar and mustard oil/paste or wasabi oil, mul-naengmyeon I think is one of the more balanced tasting Korean dish I know. Stumbled here few days back…great site…one of the most interesting site about Korean food/life I’ve seen…! i hate any form of ice in the naeng myun. waters down the broth! Actually, a good many places don’t add ice. Instead they have the broth in a giant tub that freezes it into a slush. 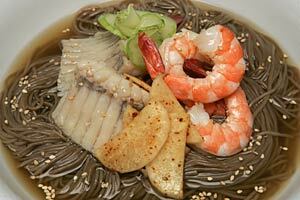 hmm I never had shrimps in my naengmyeon.